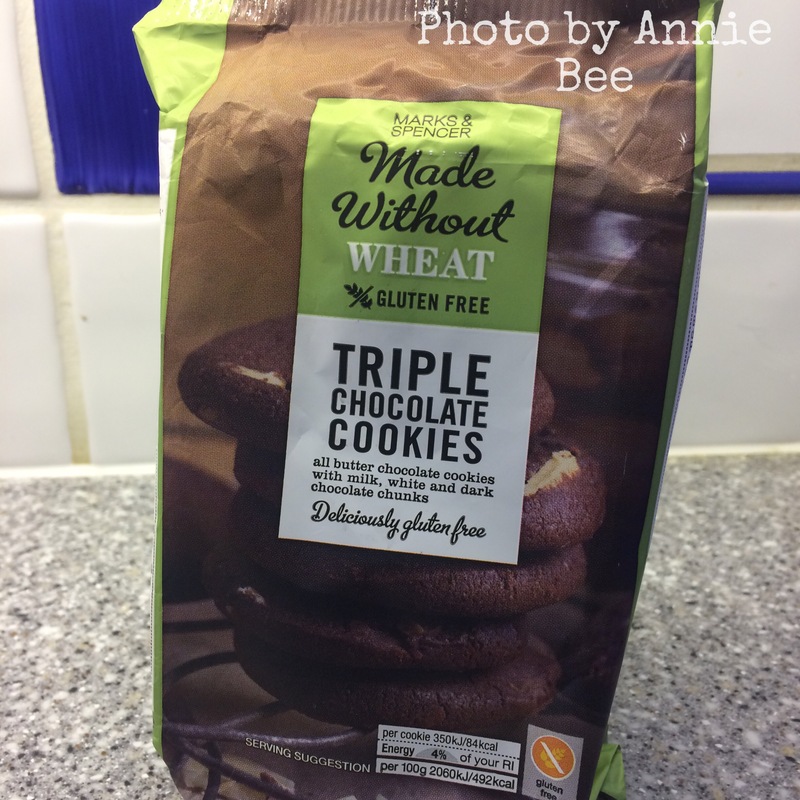 We coeliacs have to look far and wide for our fun (although I concede that eating gluten-free [GF] foods is much easier than it was even 10 years ago). 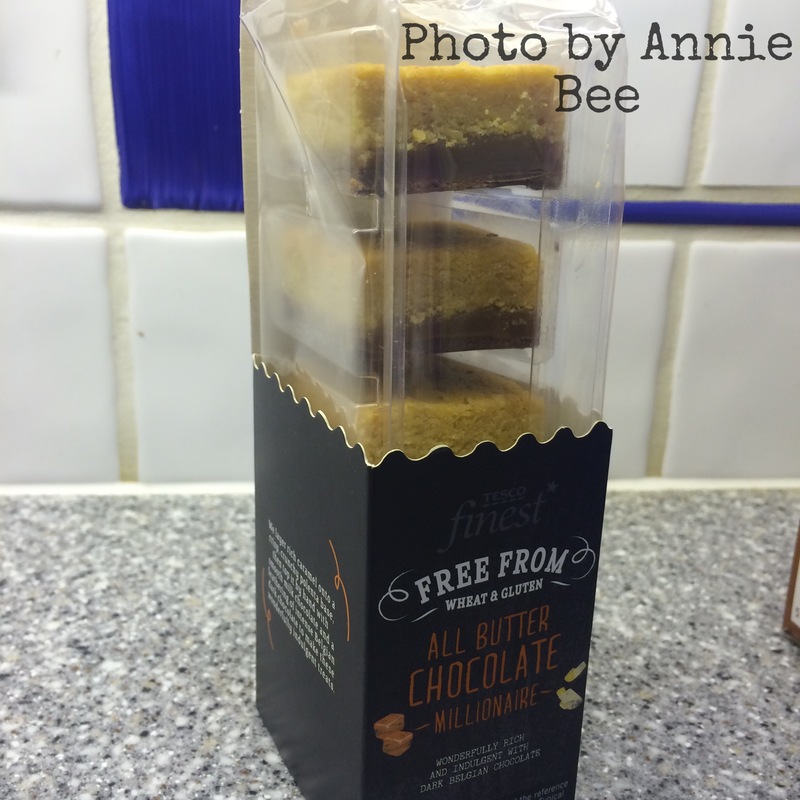 So I decided to invite a few coeliacs around to Bee HQ to sample some GF cookies. Just an excuse to forego a proper breakfast and move straight to the carb/sugar rush? Perhaps, but also simply a bit of fun and a good opportunity to meet some new people. Where did I recruit these lovely cookie-eating-helpers? The town I live in has a group FaceBook page specifically for parents – people on it are helpful, polite and friendly so I decided that was a good place to start. I was hoping for a group of 5-6, but conducted the taste testing on a weekday morning when I was not teaching; the majority of people were of course at work, and others had child-minding issues. Oh well, all the more cookies for us – but thank you to those who were enthusiastic but couldn’t come along. I will say upfront that this was in no way a scientific experiment. To be clear, A) there were only 3 of us doing the tasting. 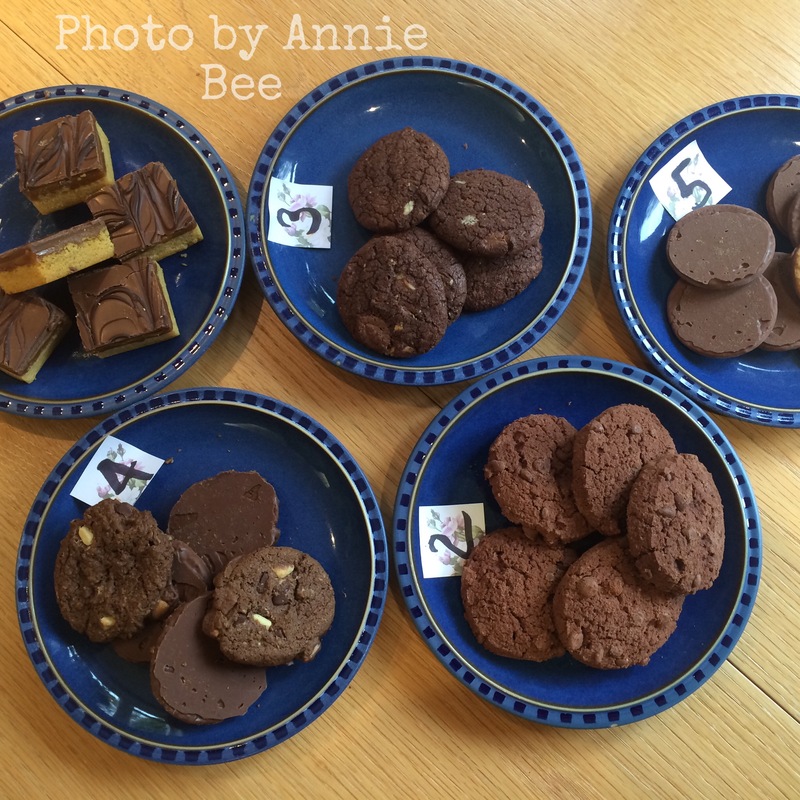 B) The cookies and biscuits were all slightly different, though themed around CHOCOLATE (hooray!) In a proper taste testing, you would have 6 plain digestives, for example, and conclude which is the best. Unfortunately the range of GF foods does not allow this when it comes to cookies, though I intend to do a bread tasting, which would better meet that criteria. The other thing to mention is that all the biscuits/cookies were from a GF section of the shop. There are some perfectly lovely GF options (the Mrs Crimble’s range for example) of macaroons etc, but these are aimed at what I believe prisoners call the “Gen Pop” (general population) and what some coeliac wags call “Muggles”! I should also be clear that all cookies were bought by me, and I have nothing to gain from the results, other than hopefully giving you some useful information here on this page. 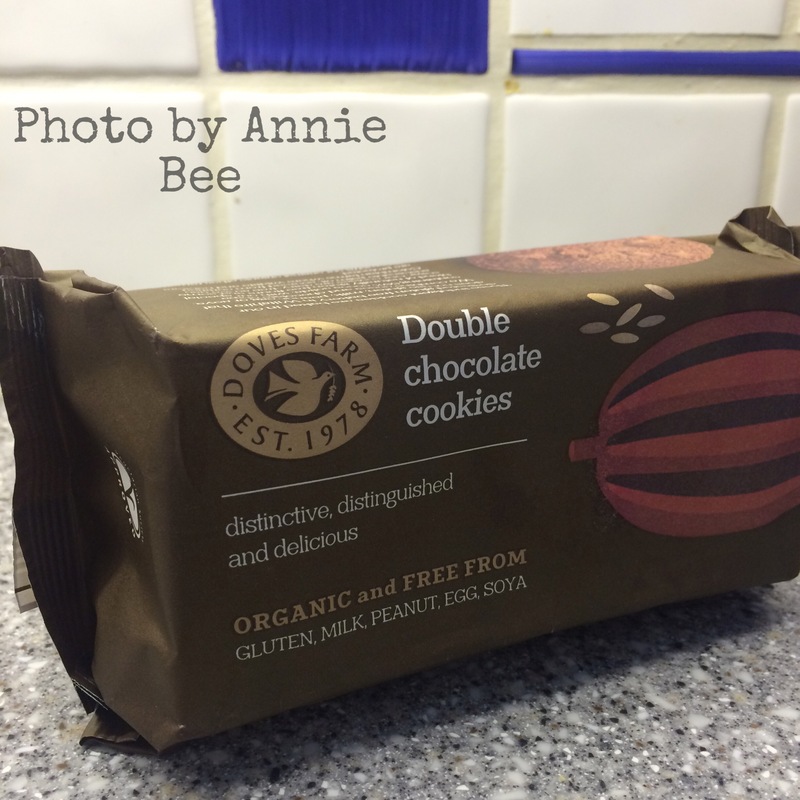 So, with hearty thanks to my two new coeliac buddies, Jackie and Sarah, I give you the low-down on which cookies left us cold and which could have passed for ‘normal’. 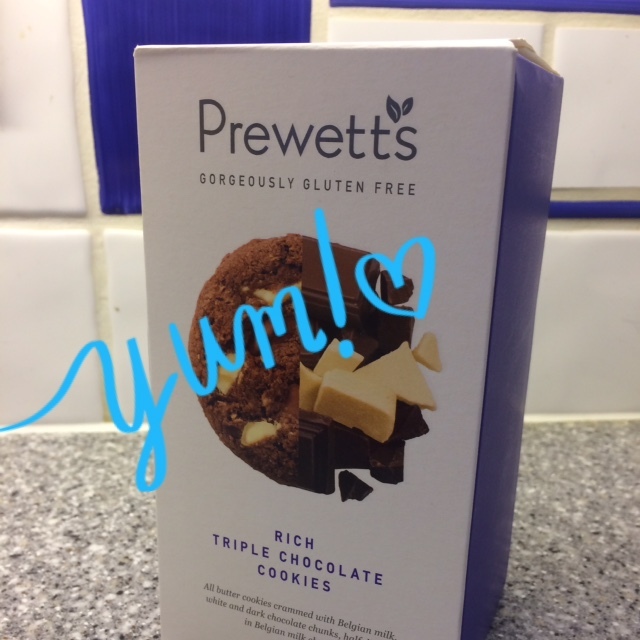 PREWETT’S – GLORIOUSLY GLUTEN FREE Rich Triple Chocolate Cookies 8 cookies, 150g, £2.29 bought in my local Waitrose, which didn’t have any own-brand GF choc biscuits or cookies for us to test. 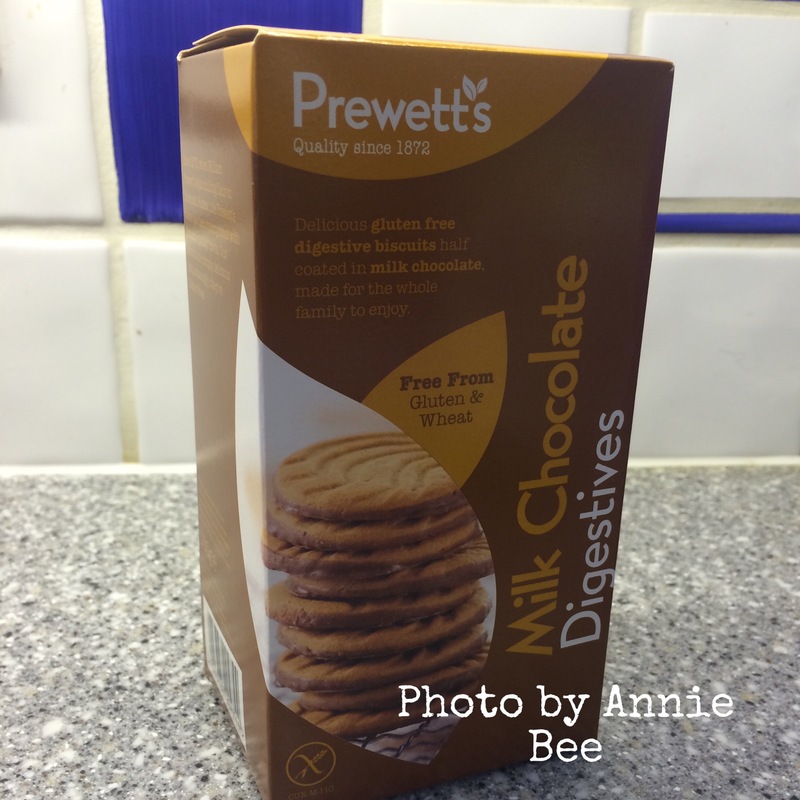 PREWETT’S Milk Chocolate Digestives 14 biscuits, 155g, £1.50 bought in Sainsbury’s which also didn’t have any own- brand for the taste-testing on the day I shopped. So what was the result? Our least favourites were described as “dry, bland, powdery, hard, greasy, oily, insubstantial, pale”. The ones we much preferred solicited descriptions such as, “crisp, chocolatey but not too sweet, melt in the mouth, nice balance of bite and crumble”. 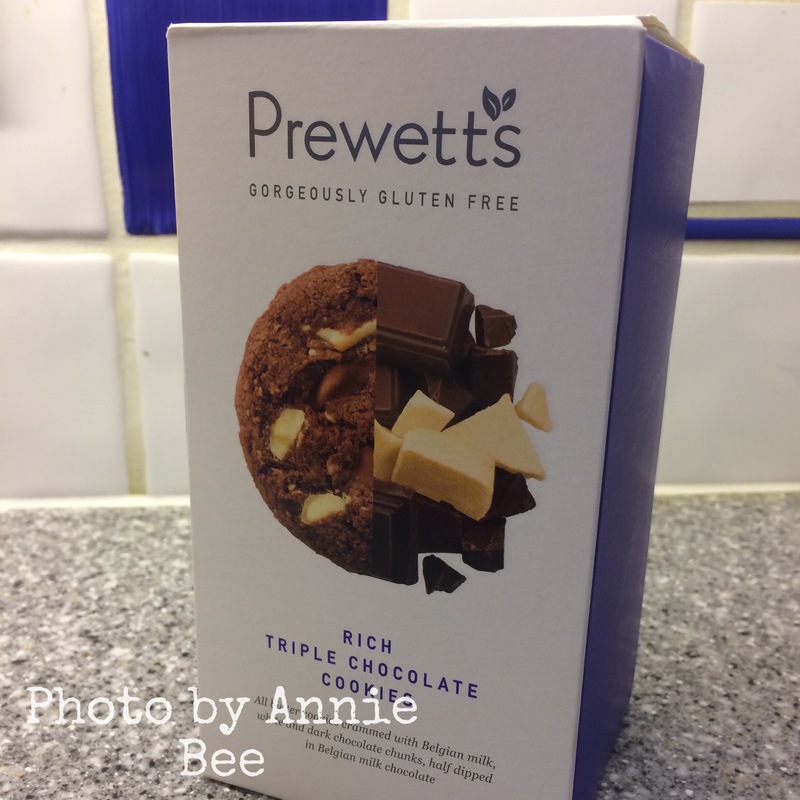 The make which all 3 of us least liked was the Doves Farm (“powdery, gritty, not much flavour, dry, brittle, bland”) and the best (also unanimously) were the Prewett’s Triple Chocolate Cookies (“appetising, chunky, chocolate-coated, delicious”). I very rarely buy biscuits (unless we have coeliac visitors) because, once opened, I lack the will-power to not plough on through the entire packet before the kettle has even boiled. I had never even come across the Prewett’s make before this week, so that was an interesting find for me. So who are they? Now based in Bristol, they do a large range of healthy and free-from foods, and you can order from their website here as well as finding their products in supermarkets and health food shops nationwide. Interestingly, their Chocolate Digestives also came out well, despite looking rather less interesting. So, my new pals and I discussed good GF recipes, and made various recommendations to each other, including this book, “The GF Cook-book for Kids”; the No G website; A Basing Cakes; an entirely GF cafe/restaurant (how often do you hear that?!!) near me here in Hertfordshire called The Saddlery Cafe which I cannot wait to visit and Atkins and Potts who apparently do exquisite GF sauces. So a good morning’s work. Unscientific for sure, but a lot of fun, and we all agreed that the trials and tribulations of having Coeliac Disease are diminished when shared between friends over a cup of tea or coffee. And cookies. 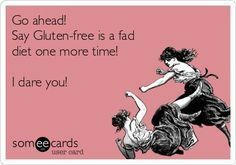 I follow a couple of Facebook groups which are there to support coeliacs in the UK through their gluten free journey. There is a diverse spread of people of all descriptions on there, including those who are still ‘at sea’ with what they can and cannot eat after a diagnosis of Coeliac Disease (CD). 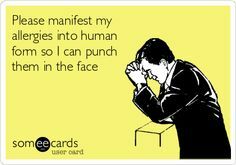 This can lead to debate, confusion and unhelpful (but sometimes humorous) posts; it can also unfortunately descend into sarcasm and downright vitriol. The vast majority of the time though, there is a great deal of helpful information. Hooray for camaraderie amongst coeliacs ! 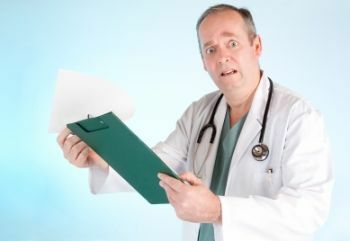 All coeliacs, when diagnosed, are on a very steep learning curve for the management of their disease, which is often diagnosed (or not – see my blog post on misdiagnoses) after a troubled descent into ill-health and dramatic weight loss. I was so ill before my diagnosis, I assumed I was dying of cancer, but then I am not known for my eternal optimism! Mind you, the unwarranted hysterectomy was a bit of a downer. Add to this the horrid business that CD can’t be diagnosed unless the patient is still eating gluten at least once a day for 6 weeks before tests can be accurately carried out, and you have a tranche of very upset, ill and often confused people on your hands. Quite a few of the FB posts on these sites are about how coeliacs are being dealt with by the NHS, whether it is the GP or consultants. So it is interesting to note that NICE (the National Institute for Health and Care Excellence) have just brought out some updated guidance for health professionals. If you are struggling with getting tests done, or being pushed from pillar to post, but suspect CD, some of this could be worth knowing. first‑degree relatives of people with coeliac disease. consider the need for specialist dietetic and nutritional advice. If you have a good, sympathetic and helpful GP, you hopefully won’t need to cite any of this information, but the more educated we are about what is expected of our health workers, the better. NICE guidelines are just that though: they are recommendations for best practice rather than ‘rules’. So if you are getting the runaround and think it could be CD, you could take a copy of these guidelines with you to the GP. Life as a coeliac after diagnosis is relatively simple, though not without its frustrations and stresses. And there is always some humour out there if you look hard enough. I am that woman you see at the supermarket who looks like she has all the time in the world, reading the backs of foodstuffs, with seemingly nothing better to do. And as I am the resident Fridge Fairy here at Bee HQ, 90% of the time it is me who does the food shopping for the family. They know me so well at my local Sainsbury’s most of the staff and I are on first name terms. 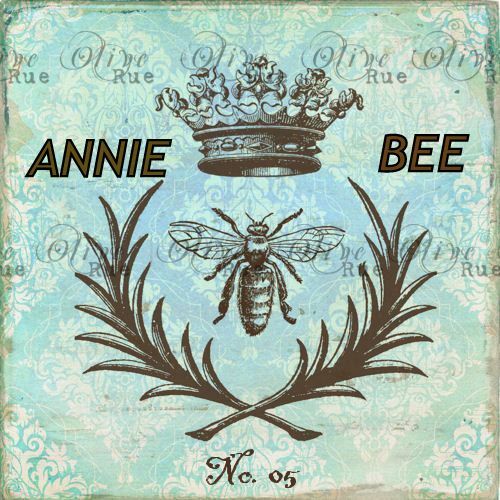 I was diagnosed with Coeliac Disease (CD) about 12 years ago, and within the last 2 years, one of the Baby Bees has developed a lactose intolerance. Add to that the usual likes and dislikes of an average family, and you have quite a specialist job on your hands (~ where is my job spec? when is my next pay rise and what about my pension?). But gluten can be hidden in the most unlikely foods, such as ice-cream (where wheat is used as a thickener) and on frozen chips. 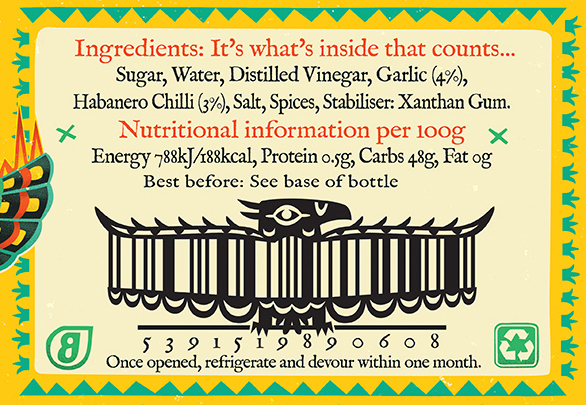 My point is that reading labels (food and drink) and understanding what to look for, has been a bit of an education over the years, but I have now got it down to a fine art. I check just about every single thing that goes in the trolley, which is perhaps a bit over the top (although, maddeningly, ingredients do change every now and again on products which used to be GF) but rather that than be ill for days and risk bringing on symptoms which can include bloating, diarrhoea, nausea, constipation, tiredness, mouth ulcers, sudden or unexpected weight loss (but not in all cases), hair loss and anaemia. (Yes, CD is a laugh a minute). 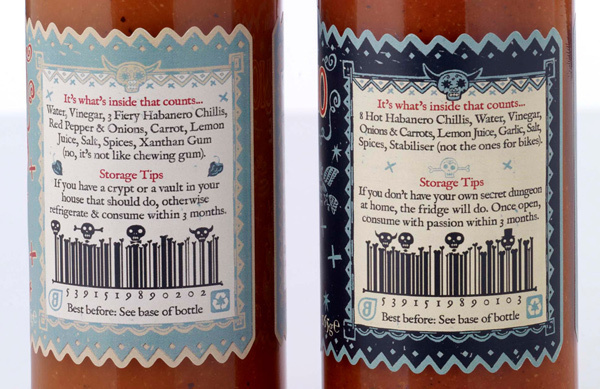 I feel I should add that my family are also very good at checking labelling. There are some other examples, though not enough. I think the more the merrier ~ we coeliacs need as much fun and entertainment as we can get, and we don’t care where it comes from, even the supermarket aisles. 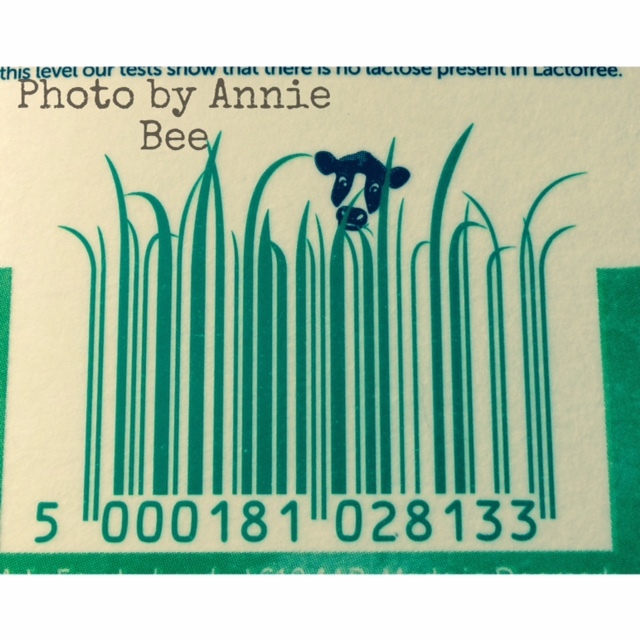 Have a look out for any eccentric barcodes or food labels and send them through. I am currently in wet and wild Cornwall. We aquaplaned down the M5 with the heating on full blast, wondering whether these ‘staycations’ are all they are cracked up to be. Thankfully we are not camping, or swimming as it is sometimes referred to here in the West Country. I did remember to pack some annoying clichés: rain never killed anyone (oh, I think it did) and there’s no such thing as bad weather, only bad clothing. This morning, with a very beady eye on the forecast, Mr Bee and I went on a bracing 5 mile trek along the Cornish Coastal path and we timed it well. Other than some slightly nerve-wracking stray cows and 2 very intrepid (mad?) runners, we met hardly a soul. While it could neither be called ‘hot’, nor ‘August-like’, we managed to stay on our feet despite the gales, dodged the showers and got back in one piece. At this point an early lunch beckoned. 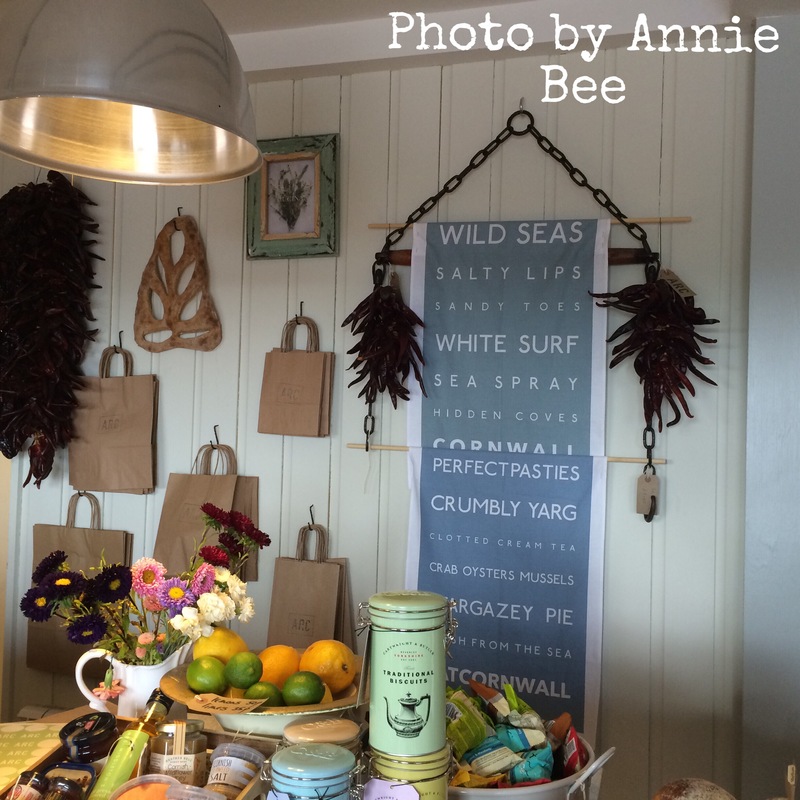 Cornwall these days has many pockets of pure foodie heaven. 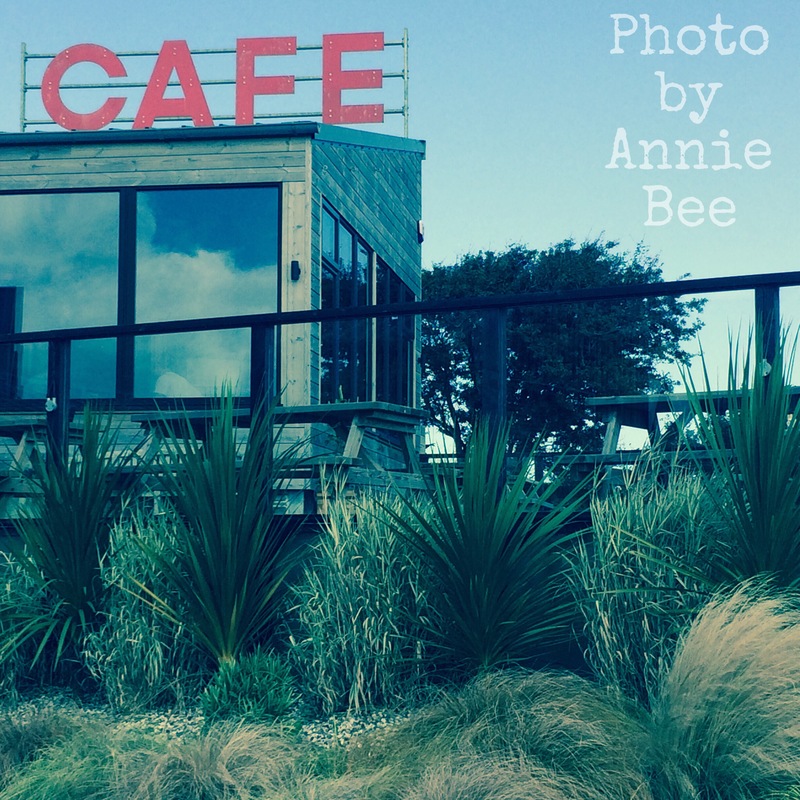 One of my absolute favourites is Strong Adolfo’s, a cafe on the A39 (or Atlantic Highway) which is part of the Hawksfield Cornwall site. 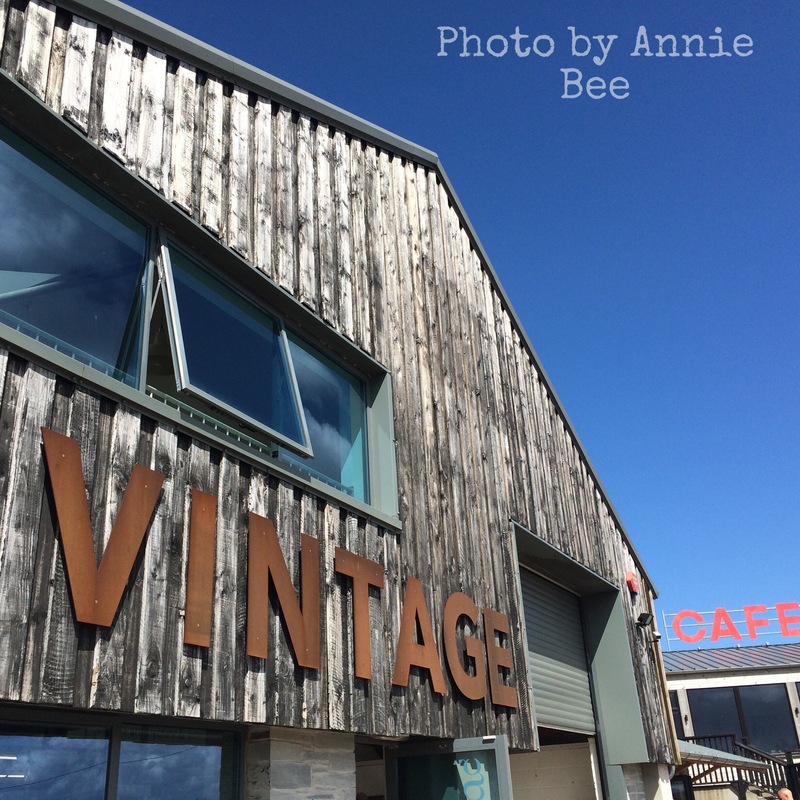 A couple of miles from Wadebridge, it is made up of a number of units which include a fabulous speciality food store called The Arc, which stocks lots of locally sourced goodies; a beautifully curated vintage furniture store called Goose Shed; an interiors shop, Jo & Co Home, as well as an art gallery (Circle Contemporary) and The Library which Hawksfield describe as an ‘open plan office space designed for individual users who want to take the office out of the home and into a social environment where you can network and grow your business’. Sounds heavenly. 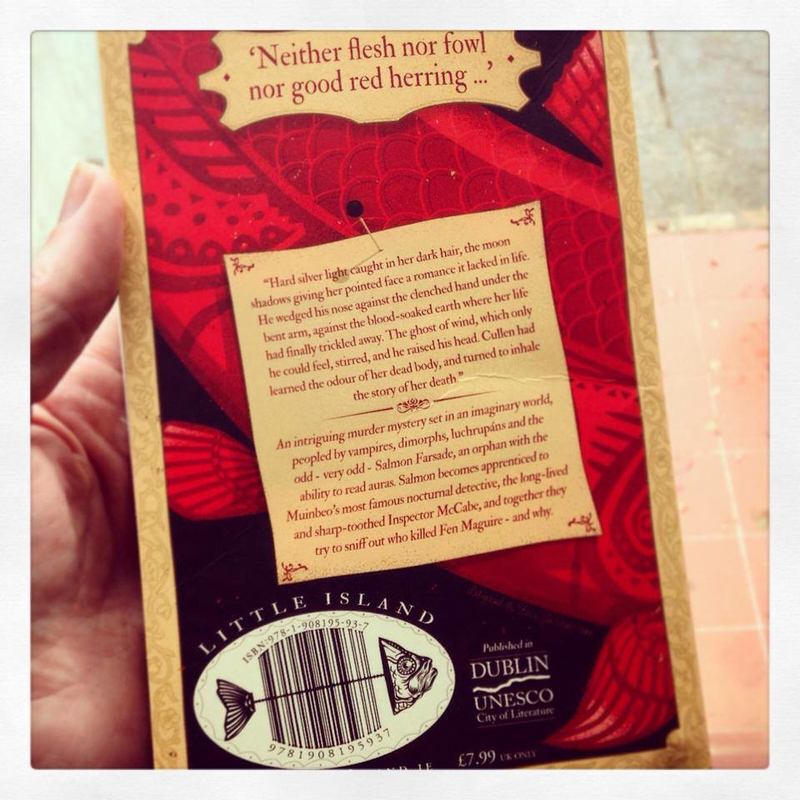 One of the main reasons I like Strong Adolfo’s is their unfazed approach to food allergies, in my case Coeliac Disease. They take the whole gluten free issue utterly in their stride, and frankly anywhere which offers GF Frangipani Cake is going to get my vote ~ e-v-e-r-y time. 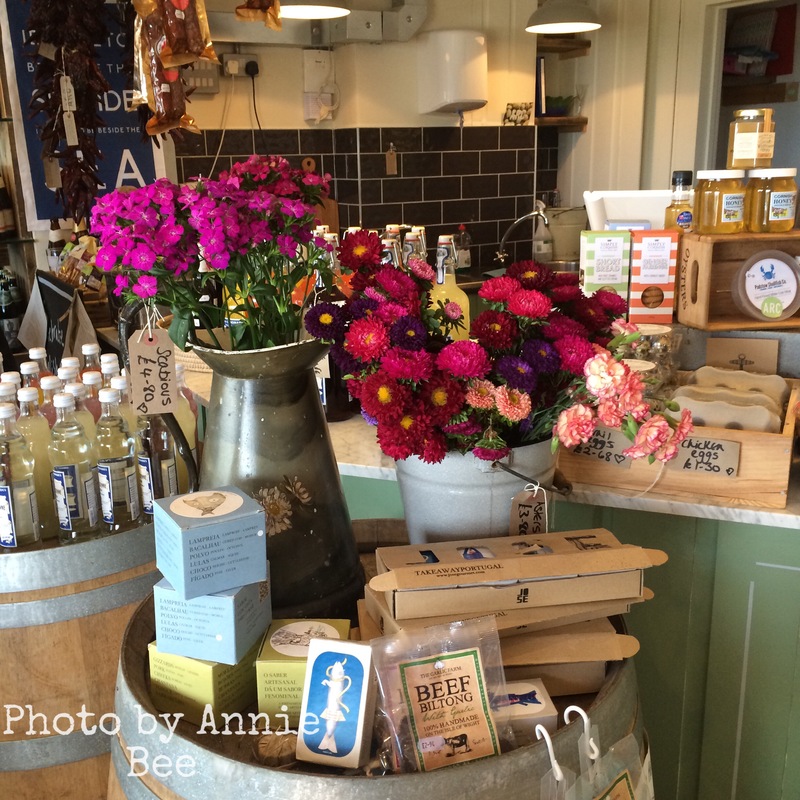 The food is good value, fresh, thoughtfully put together and the surroundings are great fun. 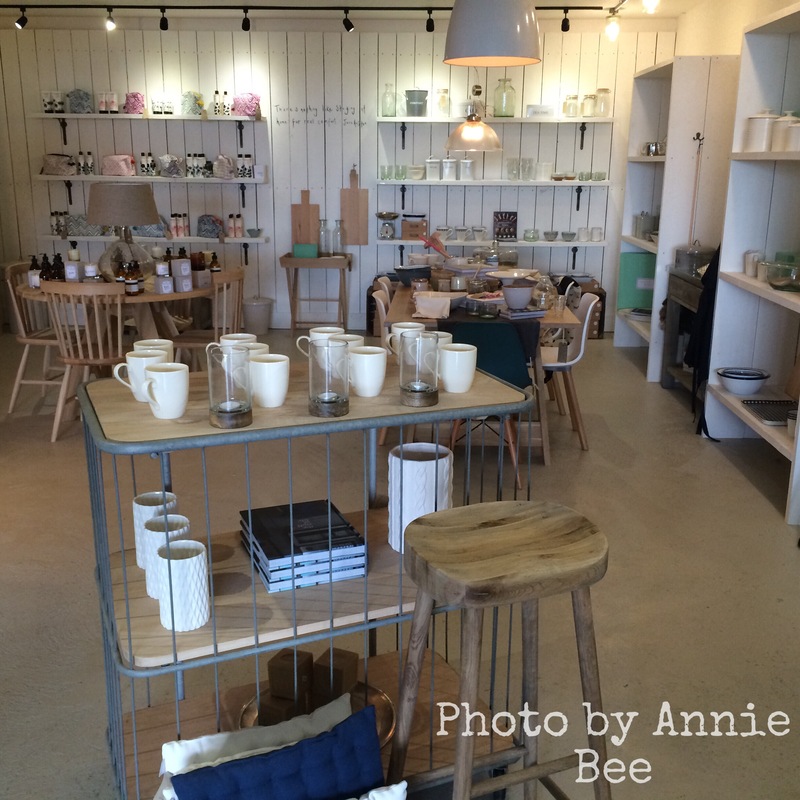 We had a delicious lunch, bought heaps of treats in the deli, as well as a new clock from Jo & Co Home. Oh and a mug with a bumble bee on it which I could not resist. If you are anywhere near this neck of the woods I highly recommend a visit. It is always fascinating travelling abroad as a coeliac – sometimes surprising (New York several years ago was alarmingly nonchalant and unhelpful about gf food) and often a bit stressful too. If travelling to a country where English is not the mother-tongue, we coeliacs have to travel with translations of some basic info on gluten which we hand to waiters, after which we pretty much have to hope for the best. I am in Australia currently and must say that there is plenty of gf food on offer and a high level of understanding about food allergies in general. However, I did come across an entirely new thing yesterday, which was where food on a menu in a cafe was labelled as “low gluten“. 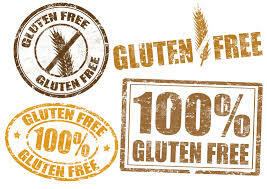 In the UK, gluten free food is where the food contains 20 parts per million (ppm) of gluten or less. 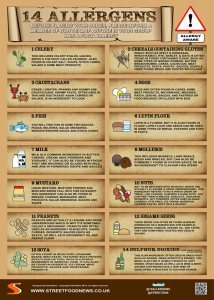 Technically, very low gluten is where foods contain between 21 and 100ppm gluten. …..as little as 50mg gluten (equivalent to 1/100th of a slice of standard wheat bread) can damage the small intestine of a person with coeliac disease. Getting here on the plane was interesting. Airplane food is seriously lagging behind for coeliacs, so I got the ubiquitous couple of slices of melon followed by 2 rice cakes and jam. I ended up eating a bowl of nuts to supplement the meals. I have a feeling that often the gf airplane meal is also dairy free (and maybe kosher as well?) so it is a very, very long way from exciting. Oh well, it makes arriving in the destination that bit more exciting. 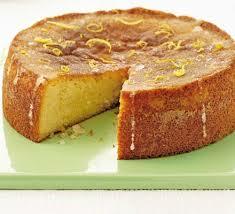 Especially when your sister-in-law has made a beautiful gf orange cake. Yum. Concerned about cc? Let me know what your experiences are. 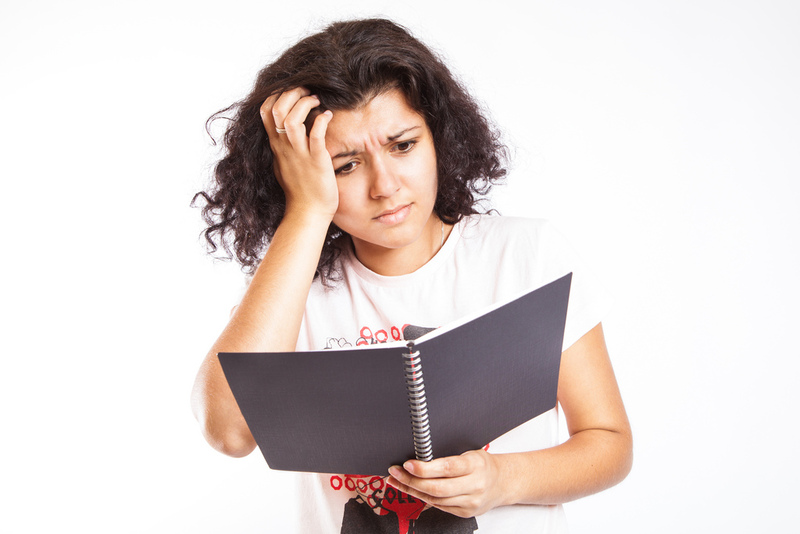 Not only is Coeliac Disease (CD) tricky to spell, it is also difficult to diagnose. It can hide behind many other things, irritable bowel syndrome – IBS – probably being the most common. For a correct diagnosis to be made, there is a simple blood test which shows up certain antibodies. If positive, that is subsequently followed up by a gut biopsy. Confusingly, it is possible to have a negative blood test and yet have CD; the most important thing during this diagnosis stage is you mustn’t stop eating gluten. Counterintuitive, I know, but that will be enough to skew the results. So what are the GPs diagnosing in our doctor’s surgeries if not CD? ….. hepatitis, mesenteric adenitis (swollen lymph in the abdomen), IBS, growing pains, stress, pernicious anaemia, hormone imbalance, chronic fatigue syndrome, gastric reflux, tummy bugs, bi-polar disorder, anxiety, cyclothymia (a mild form of bi-polar), stomach ulcer, depression, lactose intolerance, fibromyalgia, fructose malabsorption, nerves, anorexia, indigestion, pancreatic cancer, bowel cancer, endometriosis, mental illness, prostatitis, cystic fibrosis, crohns disease, STDs and bulimia ……. Extraneous surgeries: thyroidectomy, appendectomy and hysterectomy (me). My all-time favourite, trumping even the person who was told twice he had STDs, is hypochondria. I am not sure whether to laugh or cry! My tale of woe is as follows: having complained of feeling tired and generally ill for a year or so, I was tested for anaemia. My iron levels were worryingly low and didn’t improve with massive doses of supplementary iron (at one stage I was taking enough iron every day to build a small bike). My periods were called into question – “are they heavy?” An impossible question to answer in my book as I have never had anybody else’s periods so what was I comparing them to? So I said I thought they could be, yes. Next thing I am under the knife having a hysterectomy, a major op by anybody’s standards. They left my ovaries which I now call “gluten” and “free”. Thankfully I had finished my family (I was in my late 30s at this stage) and I won’t lie and say I was not happy with the upside of no contraception and no periods. Imagine my surprise when 5-6 years later, after a terrifying 6 months of appalling symptoms, misdiagnoses galore and massive weight loss, I was told I had CD and the anaemia had been caused by the malabsorption of nutrients all along. My gastroenterologist also added that, from the state of my villi (finger-like projections in the small intestine that help absorb food more efficiently in the body) I may well have had CD for decades. Back in 2013, the British Society of Paediatric Gastroenterology, Hepatology and Nutrition (BSPGHAN) and Coeliac UK, the national charity for people with coeliac disease came up with a new approach to diagnosing CD in children. This new recommended approach will aid more accurate diagnosis, help children get treated more quickly and should bring savings to the NHS. “This new guidance for healthcare professionals is valuable on two fronts. Firstly, it gives paediatricians the tools to better recognise coeliac disease in children, allowing them to diagnose more swiftly and accurately. And secondly, it reduces the need to perform unpleasant, intrusive procedures on children when attempting to diagnose the condition. It’s a much needed resource to address what is a relatively common but often misunderstood disease amongst UK children. Currently on average patients have had symptoms of coeliac disease for 13 years before they are diagnosed which, for many, can result in years of discomfort and pain as well as damage to the gut which could lead to other conditions if not diagnosed and treated. Well, I am no expert, just a coeliac sticking to the gluten free diet I must, but clearly more needs to be done in making these diagnoses fast. Let me know what you think. Have you too been misdiagnosed along the way? I recently joined an incredibly interesting, friendly and helpful Facebook page entitled, “Coeliacs Eat Out Too …… They Also Live Everyday Lives”. If you suffer from Coeliac Disease, it is always nice to be able to share info, moan a bit and support others who have this auto-immune disease. ~ I hate ‘the folder’. It’s poor customer service pretending to be good service. ~ The whole file was so confusing as ingredient listings were spread over lots of pages. The main part of the meal was listed in one section, then sauces in another, sides in another so I had to check lots of different pages for each item on the menu. I ended up choosing the first thing I found as I couldn’t be bothered to plough through the information. ~ It just annoys me. Vegetarians get a nice little green ‘v’ on the menu and are pretty well catered for, and we have to wade through this massive folder! I have encountered the folder a couple of times – once it took me over 20 minutes in the pub to cross-reference everything in the folder against the 3 menus on offer that day (lunch, specials and pre-Christmas). I was stressed and harassed by the time I came to order, as was my fellow diner. I will not go back there again. Some coeliacs say that it is better to get the folder treatment than have the waiter say “what is gluten?” (if that happens, I walk out). I agree, but there has to be an easier way. What is wrong with the chef or the company marking all the menus for us? In the UK, it is estimated that 1-2% of adults and 5-8% of children have a food allergy. This equates to around 2 million people living in the UK with a food allergy, this figure does not include those with food intolerances. This means the actual number of affected people living with food allergy and/or food intolerance is considerably more. 12. An allergic reaction can be produced by a tiny amount of a food ingredient that a person is sensitive to (for example a teaspoon of milk powder, a fragment of peanut or just one or two sesame seeds). Symptoms of an allergic reaction can range from mild symptoms such as itching around the mouth and rashes; and can progress to more severe symptoms such as vomiting, diarrhoea, wheezing and on occasion anaphylaxis (shock). 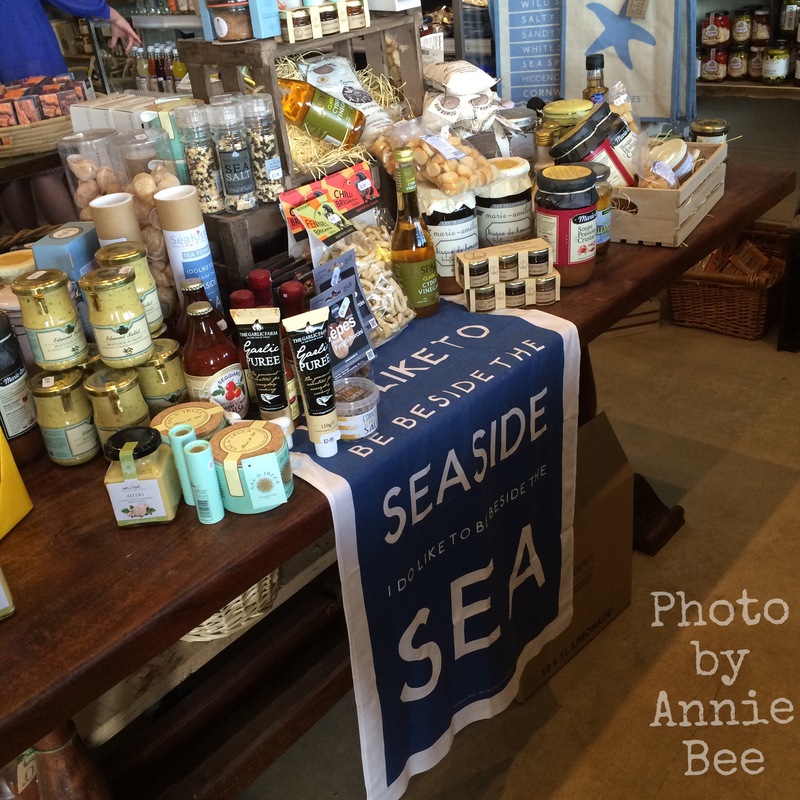 Around ten people in the UK die from allergic reactions to food every year. There is no cure for food allergy. The only way to manage the condition is to avoid food that makes the person ill. This can be achieved by checking ingredients details on labels of prepacked foods and being provided allergen ingredients information for non-prepacked foods. Therefore, it is very important that food businesses provide clear and accurate information about allergenic ingredients in their products. Let me know if you have been given the folder treatment – annoying or essential? Let me know.